She leads exercise classes and games, calls Bingo numbers and organizes the Friday-morning breakfast club, but Edit Jarvela knows what gets the crowd rocking the most. Every few days, Edit brings her accordion to Oakton Pavillion and throws down the old grooves for a table full of listeners. An activity aide since moving from Austria 33 years ago, Edit is now in her 25th year of playing accordion for Pavillion residents. She said she keeps lugging the bulky thing around because there is always a new face at the table to entertain. Edit has had music all of her life: born in Vienna, Austria, her entire family played instruments and jammed together in their home. Her father and brother played the violin, and her brother’s friend played the accordion; Edit always loved the sound of the unique instrument, but her father instructed her to learn the piano so she could accompany the men. Content to work the keys, Edit grew up, moved to the United States and became an activities aide for Oakton Pavillion. As many aides do, she befriended several residents and their families; in the early 1990s, one woman noted that she and her husband had bought an accordion for their son, who refused to play it. 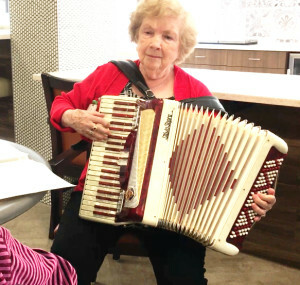 When the woman left the Pavillion community, she brought the accordion on her final visit – a gift for Edit. Who had always liked the sound, but never handled such an instrument before. Suddenly, as an adult, Edit was faced with learning something that was unlike anything she had tried before. She threw the two straps over her shoulders, sat the heavy Silbio Sopra in her lap, pulled it outward and started figuring it out. “Basically, I taught myself,” she said. Trained since her girlhood to read music, Edit studied the sounds of the 30 keys at her right fingertips (the treble side) and the 120 more keys at her left fingertips (the accordion has a wide bass range). The instrument covers about three octaves, she said. She started learning how to play American folk songs, as well as Austrian and Scottish traditional, then brought the results to the Pavillion community rooms. She knows she has the groove when residents start waving their hands, boogying in their seats and singing along. And after 25 years, the Sopra has not gotten too heavy for Edit yet. Another hour-long performance awaits, this time with a table of 15 – who all happen to be women this time. No partners, no problems : Edit has the grooves.